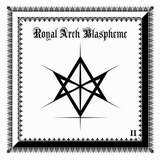 2010 self-titled debut release by New Jersey creation The Royal Arch Blaspheme was a revelation in the black/death genre, the album getting to be one of that year’s surprises for me. The brooding evil atmosphere bleeding all over that album, in the form of fantastic harmonies, made The Royal Arch Blaspheme stand out from the crowd. Succinctly titled II was then a much expected follow-up, where I thought the band would open up the dark caverns even further. Not quite, or at least so these ears happen to hear. It is if The Royal Arch Blaspheme songwriters got pretty pissed and decided to push the crude primitivism to the forefront, all those harmonies be damned. Equipped now with the full lineup, the band pulled way back from what could be called a melodic streak in the debut. As a result, II has no Isaiah 14:12 or Lust and Sacrilege. Instead, there are a number of frontal assaults here, where whole lotta blasting and chugging train-like riffs take center stage. Menacing black position totally upheld, such approach, however, led to less memorability in the songs, blending them one into another. One would not notice how Five Sacred Wounds merges into Lust, Blood, Sacrum spilling into Ashes of the Holy Ghost to follow, although the latter tries to add sweeping tremolos at the end making it more of a melodic black metal affair. Psalm 39 is another more of the same blast-and-chug fest, after Profane Rite tried to doom things out making it more Incantation-like. In fact after the vile inflections of the opener When the Cruel Nails Pierced Thy Tender Hands and Feet, my next favorite moment on the album does not come until the gloomy gut wrenching closer Broken Word of God, where indeed one feels that the end of the world is near. Was there no room for more of those devouring tantalizing moments? A few glimpses of gnawing underdeveloped solos (like at the end of Five Sacred Wounds) and N. Imperial delivering vocally throughout, croaking, suffocating and gurgling out his own anger, do not rescue the album for me from settling into a predictable rut. And speaking of production, not that the bands like The Royal Arch Blaspheme are expected sound clean, the self-titled debut was way fuller and more powerful than II. If the point of the album was to BLASPHEME in the most primitive primordial way, then the band definitely succeeded. Tarry black sludginess of II comes at you in a way you would be hardly able to wash off. However, there is nothing ROYAL or overARCHing here. With this album I get the point directly and fast, without ever wanting to hear it again. It is a one and done deal, while I still remember relishing and coming back to The Royal Arch Blaspheme, the album, on the repeated basis.